Some restaurants require a snack beforehand and possibly a slice of pizza after. Others require nonconstrictive wardrobe considerations, like stretchy pants, no belt, or even no pants (a loose dress is best for maximum hidden belly expansion). Rotisserie Georgette, a newish rotisserie restaurant with a “French accent” on the Upper East Side, falls somewhere closer to the former. On a recent lunch with two girlfriends, Sherry and Sung, while the food was quite tasty, I couldn’t help but think everything was a bit lacking portion-wise. 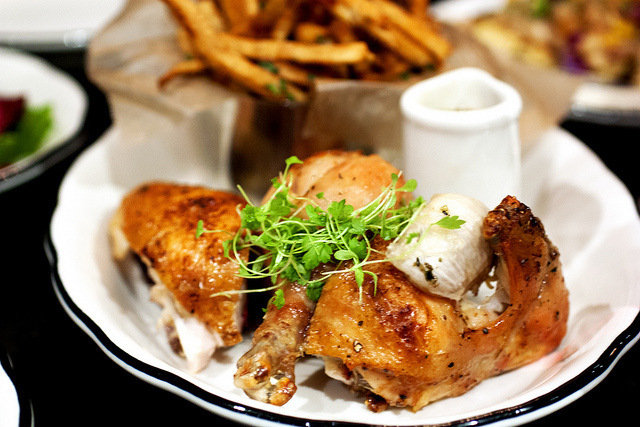 The specialty of the house, the Poulet Frites ($29; pictured above) — half a rotisserie chicken with jus Provencal, French Fries, and a side salad with mustard vinaigrette — was delicious as expected. The meat was tender, the skin rendered crisp, and the accompanying jus ensured no bite of chicken would ever be dry or lacked any flavor. However, considering the chicken was on the small side, more fries, or an extra leg couldn’t have hurt. 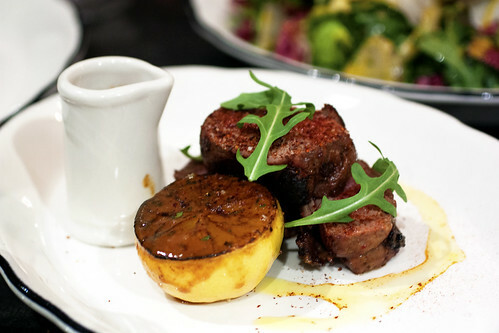 The Culotte D’Agneau ($32) — top loin of lamb with lamb jus, harissa, mint, and lemon confit ($32) — was even smaller. Also, we were told the Chef recommended the lamb medium, but medium-rare would have been better. My piece was a tad dry. For the third dish, we had planned to order the Poulet Roti Pot Pie, but the pot pie had sold out, so we settled on the Salade Francine ($26) — a mixed salad with artichoke hearts, wax beans, Parmesan chips, and carrot-coriander vinaigrette topped with house-made lamb merguez — after the waiter recommended the salads more than once. Bad call. The salad was fresh and plentiful, but the merguez was again small and also could have been fattier. The salads might be popular with the “ladies who lunch,” but I for one am no such lady. 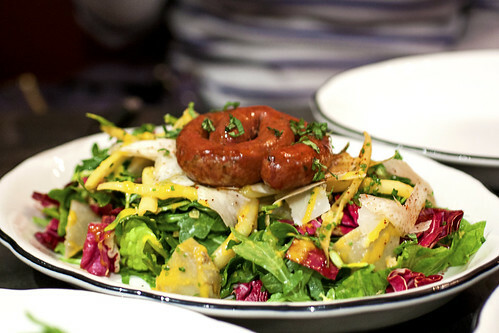 If I order a merguez salad for $26, a single coil of sausage just won’t do. Double or triple please, and throw in another handful of those addictive Parmesan chips. 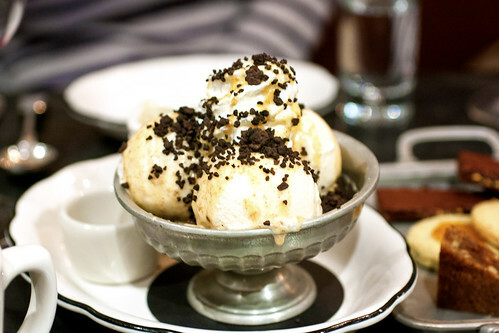 For dessert, we shared a bowl of house-made Brown Butter Ice Cream ($10) with brown-butter sauce and chocolate crunchies on the side. No complaints here. The ice cream was smooth and the sauce lovely, although who wouldn’t want more brown-butter sauce if given a choice. 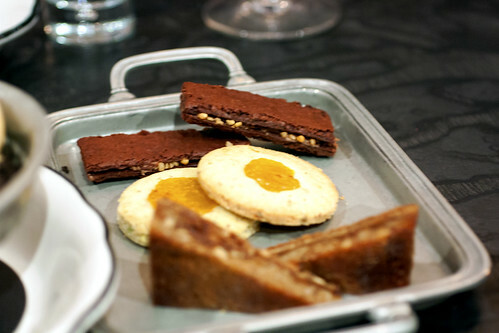 We also couldn’t resist ordering the cookie plate called the After Party ($12). Although when it arrived, we all thought it wasn’t much of a party. There was a chocolate sandwich cookie with hazelnut cream which was decent, pistachio apricot cookies which were good if you liked jam cookies (I’m not a huge fan), and salted caramel and pecan cookies which I liked the best because they were reminiscent of pecan pie in chewy dessert bar form. All said and eaten, I’d still go back to Rotisserie Georgette, but next time I’ll know to order accordingly: more meat, no salad, and perhaps an extra side of French fries. As for wardrobe, no dress necessary.